I'm partial to sterling silver jewelry, so when I saw this gorgeous silver necklace I did a double take! Add to it the imprint of a sheaf of wheat - it got this prairie girl's attention! This necklace is simply a beautiful piece to add to anyone's collection of fine silver jewelry. It is part of a collection of silver pieces found at jakecleo. 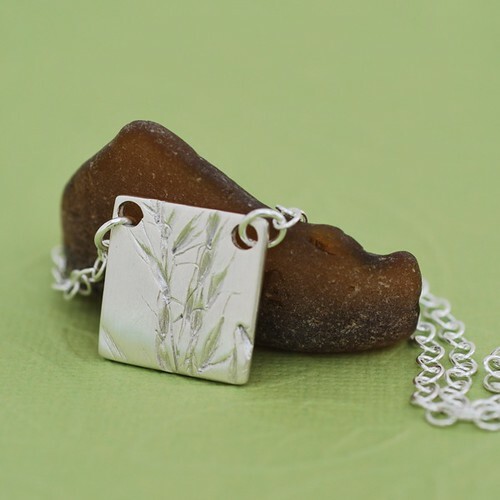 In their shop you will find sterling silver jewelry with botanical and geometric themes. Their jewelry is modern, eco-friendly and made with care. Jewellery is something you'll find plenty of on Etsy I assure you. But what if you're looking for something that's unique? An original piece just for you that no one else will ever have. Well, then Vitrine is the place for you. Candice is the creative force behind these modern, contemporary pieces that are sure to turn heads. Her work has been sold in galleries in Canada, Europe, and the Middle East, and now you can own one of Vitrine's original one of a kind creations. Get comfy and take a moment to get to know Vitrine. It's always interesting to hear about the creative process that goes on behind the scenes. Candice: I have a few that I call favorites and the thing that they have in common is that they're all wire wrapped. I love how wire wrapping showcases them as unique pieces because no two are ever alike. Candice: I am by nature a very curious person. I like to find out how things are put together and then try my hand at it. So I ordered a few books on jewellery making from my local library and watched some Youtube videos, and, of course with trial and error perfected my wire wrapping techniques. 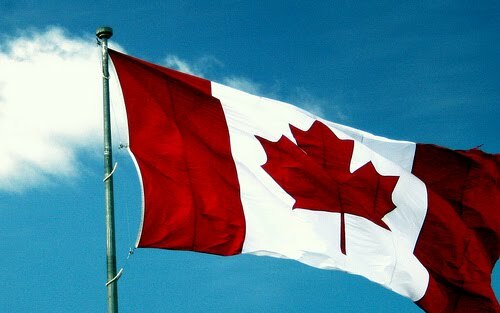 Oh Canada: Everyone has different motivations for making their unique wares.What drives you to create? Candice: I come from a very creative family. My dad paints and my mum sews. My aunts all crochet, knit, or sew. So as young as 3, I remember asking my mum to show me how to embroider. I've never been able to sit down and not keep my hands busy! I love coming up with new ideas and projects. In fact, I usually fall asleep thinking of a new way to showcase a stone or bead. Sure beats counting sheep! Candice: I would like to take a silversmithing course and learn how to bezel using gemstones. Candice: I'd like to possibly introduce jewellery with some sort of fabric aspect. I have tons of ideas and never enough time to do them all! Candice: Meeting people who are so talented. Some products on Etsy literally blow my mind, and inspire me to keep on creating. I am also lucky that I belong to a couple of teams(including the Oh Canada Team) where the camaraderie and support are so phenomenal that it almost makes you feel like you belong to a guild. Candice: Take the best photos you possibly can of your items. And I'm not talking about getting an expensive camera. Find free software that can tweak your pictures so that they're brighter and more appealing to potential buyers. Candice: Handmade soap. Totally luxurious to know a bar of soap was made just for you. Candice: I love these AAA rutilated quartz earrings. It's quite rare to find so many rutiles in each stone- it's one of my best finds. You can keep up with Vitrine by visiting her on Facebook, Twitter, and her blog. 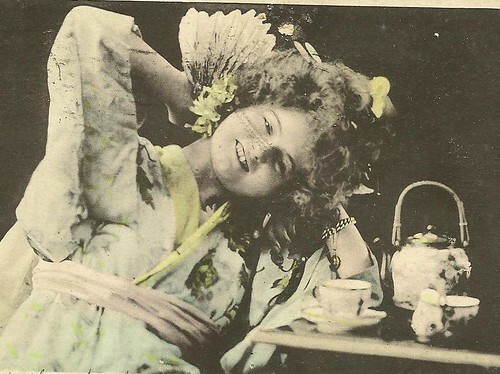 This week's Friday Find is a vintage postcard from TheOldBarnDoor Dating from the turn of the last century, this black and white postcard features a young girl dressed in geisha costume, posed as if she's preparing to have tea. Her engaging smile is so captivating and contageous that this is a fun and uplifting Friday Find. You can find more delightful vintage postcards, as well as trade cards, stamps, books and magazines in Theoldbarndoor's Etsy shop. 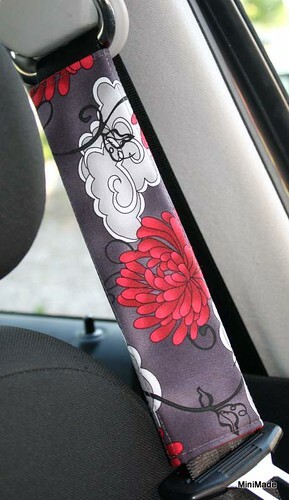 This week's Friday Find is a lovely padded, reversible seat belt cover in black, greys, and red by MiniMade. This ingeneous creation wraps around the seatbelt and fastens with velcro to protect your neck from chafing and irritation while driving. Available in a variety of colors/patterins in the WhatSewEver section of MiniMade's wonderful Etsy shop which is full of handsewn creations. Offering bags of all kind, tea cozies, table runners, placemats, and more...if you're looking for it, she probably makes it, and it's gorgeous. Copyright 2011 Oh Canada Team and MiniMade.